Group exhibitions include the British Art Show 5 (2000-01) and Big Bang, at the Centre Georges Pompidou, Paris (2005). In 2004 she was awarded the Paul Hamlyn Foundation Award for Visual Arts. Though Gunning originally trained in sculpture much of her work uses film, video and performance, often within a site-specific context. Her critically acclaimed video work Climbing Around My Room (1993) shows a female figure attempting to manoeuvre her way around a room, using only its furniture and architectural features to ensure that her feet never make contact with the floor. 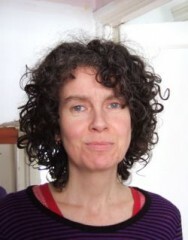 In 2007 Gunning created The Archive, The Event and its Architecture, a multi-faceted work that resulted from her experience as artist-in-residence at the Wordsworth Trust, Cumbria. The work included a publication and three events, a walk, a symposium and an event at the village hall at which all the regular village hall activities were carried out simultaneously. Also in 2007 she created RePhil, an intervention with the collection at the Philbrook Museum of Arts in Tulsa, Oklahoma.